Monday November 23rd 1896 It was cloudy all day and rained some. Will went over the river in the morning for a hog he had bought. he was busy about the place all afternoon. I sewed on the carpet rags. Tuesday November 24th 1896 Will went to the valley to put the colts in pasture down at Henrys. Leonard came out to tell him he could not work for her had a sore hand. I sewed on rags. George Jordan came in the evening to go to work tomorrow. Cloud still. 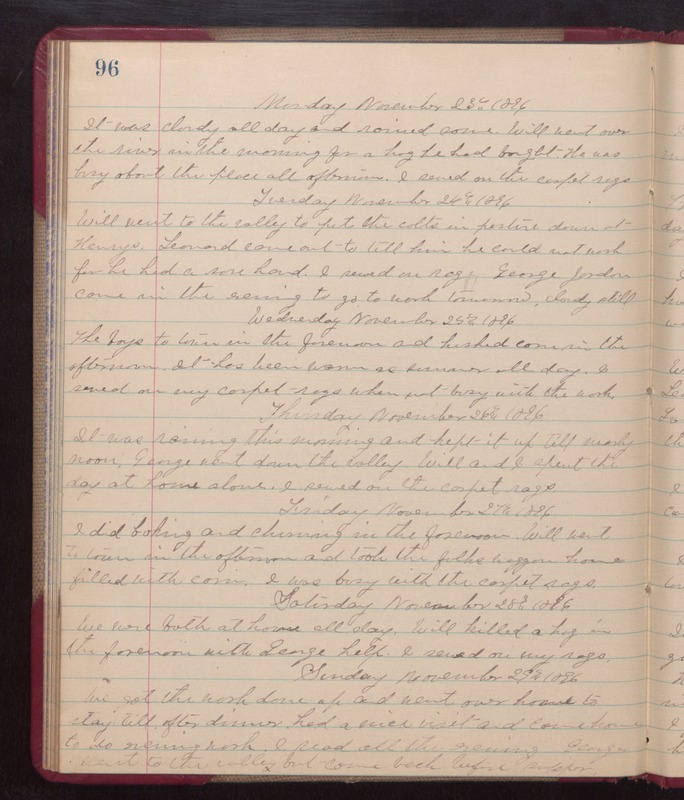 Wednesday November 25th 1896 The boys to town in the forenoon and husked corn in the afternoon. It has been warm as summer all day. I sewed on my carpet rags when not busy with the work. Thursday November 26th 1896 It was raining this morning and kept it up till nearly noon. George went down the valley. Will and I spent the day at home alone. I sewed on the carpet rags. Friday November 27th 1896 I did baking and churned in the forenoon. Will went to town in the afternoon and took the folks waggon home filled with corn. I was busy with the carpet rags. Saturday November 28th 1896 We were both at home all day. Will killed a hog in the forenoon with George help. I sewed on my carpet rags. Sunday November 29th 1896 We got the work done up and went over home to stay till after dinner. Had a nice visit and came home to do evening work. I read all the evening. George went to the valley but came back before supper.